The Jordan Brand made waves last year with their retro and hybrid shoes, and this year they promised to unveil new models that are expected to be a huge hit in the market this year. The Jumpman H-Series is one of the new models from the Jordan Brand, which hit strides during its first release earlier this month. Another colourway was released this month, the White/Metallic Silver-Black-Deep Royal, which features a predominantly white upper part with blue Jumpman logo. What are you waiting for? 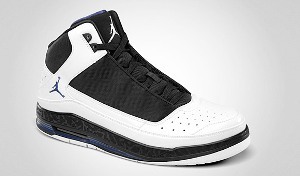 Grab one now and you will surely enjoy the comfort and the elegant design of this new shoe from the Jordan Brand.